Die Independent Faction für Star Trek Attack Wing steht im Fokus einer neuen Preview für die zweite Edition von WizKids. Hello Star Trek: Attack Wing Fans! We’re back with more Star Trek: Attack Wing previews. Today, we delve into the last of the cards from the Independents Faction Pack – A Motley Fleet including 3 Ships, 2 Crew, an Elite Talent, a Tech, and a Mission! For those of you who haven’t joined us for a Faction Pack preview, a Faction Pack is a bigger Star Trek: Attack Wing product configuration that includes a pre-constructed fleet of four ships, everything you need to equip those ships, and more! The cards featured in faction packs tend to be all-new cards that expand an existing faction and push the boundaries of Star Trek: Attack Wing to new distances that even Q never thought imaginable! To kick off this preview, we’re going to show off the new generic versions of the Maquis Raider, Vidiian Battle Cruiser, and Dauntless Class! First, we have the Maquis Starship coming in at 13 SP. This ship has a Primary Weapon Value of 2, a very high Agility Value of 3, a Hull Value of 3, and a Shield Value of 2. This small, agile fighter also comes with the Evade, Target Lock, Scan, and Battle Stations Actions as well as an Upgrade Bar with a Weapon slot and two Crew slots. While this ship can’t take or dish out the biggest hit, it’s inexpensive cost and high Agility will keep it around and make it more than worth its points. 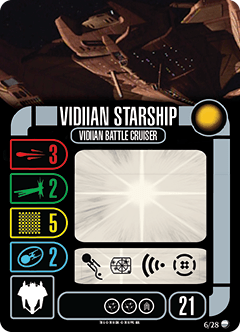 Secondly, we have the Vidiian Starship at 21 SP with a Primary Weapon Value or 3, an Agility Value of 2, a Hull Value of 5, and a Shield Value of 2. This sturdy ship also boasts an Action Bar with the Evade, Target Lock, Scan, and Battle Stations Actions as well as an Upgrade Bar with two Weapon slots and a Crew slot. The last ship from this pack is the Species 116 Starship at a nice, even 20 SP. This ship features a Primary Weapon Value and Agility Value of 2 as well as a Hull and Shield Value of 4. This ship comes with the Evade, Target Lock, Scan, and Battle Stations Actions and a whopping 3 Tech slots on its Upgrade Bar. Being able to stack 3 Tech Upgrades on this ship will make for some very interesting and powerful combinations! 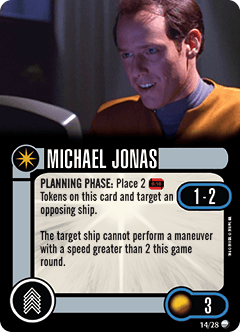 The first of two Crew Upgrades we have is Michael Jonas, the Maquis resistance fighter, turned Starfleet crewman, turned traitor from Voyager. Jonas is 3 SP, unique, and Independents. His ability allows you to place 2 Time Tokens on him during the Planning Phase to prevent an opposing ship within Range 1-2 from performing a maneuver with a speed great than 2 this game round. Being able to slow your opponents down (especially with Upgrades like Kemocite around!) can be an invaluable resource. 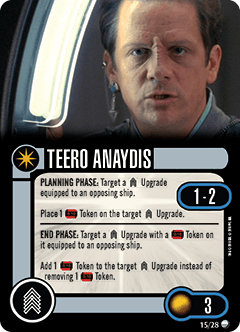 The last Crew Upgrade from this pack is Teero Anaydis, the fanatical Bajoran who was hellbent on fighting the Cardassians using methods too brutal for even the Maquis! Teero costs 3 SP, is unique, and Independents. He has two abilities, both of which target an opposing ship within Range 1-2. His first ability lets you target a Crew Upgrade equipped to the target ship during the Planning Phase and place a Time Token on that Upgrade. 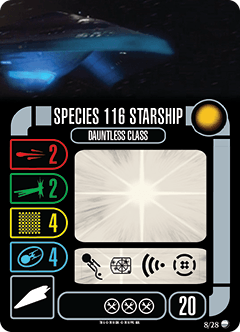 His second ability is unlike anything we’ve seen in Star Trek: Attack Wing before; it allows you to choose an opposing Crew Upgrade with one or more Time Tokens on it and add an additional Time Token to that Crew Upgrade instead of removing 1 Time Token during the End Phase. The Elite Talent Upgrade we preview today is Maquis Tactics. This is a relatively costly Upgrade at 5 SP, it is not unique, its an Independents Upgrade, can only be equipped to a ship with an Independents Captain, and it can only be equipped to a Maquis Raider. 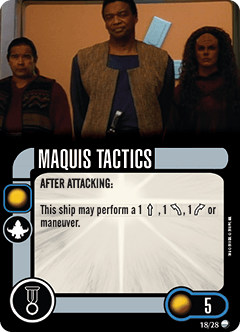 This card simply, yet powerfully, lets you increase the agile nature of the Maquis Raider by allowing it to make a 1 White Straight or Bank Maneuver after it attacks. 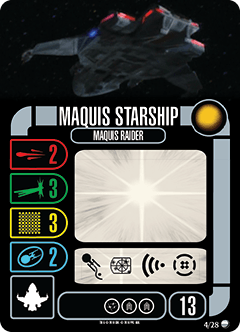 This card can be tremendously useful in allowing the Maquis Raider to slip out of the arc of an opposing ship before it has a chance to fire! Moving on to Weapon Upgrades, we have Enhanced Phasers. This Weapon costs 3 SP, is one-per-ship unique, is an Independents Upgrade, and can only be equipped to ships with a Primary Weapon Value of 2 or less. 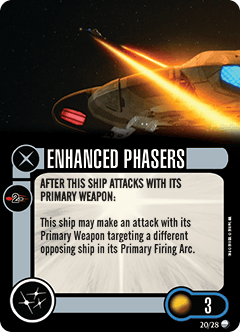 Enhanced Phasers makes it so that, after the ship its equipped to attacks with its Primary Weapon, it gets to make another attack against a different opposing ship in its Primary Firing Arc using its Primary Weapon. This Upgrade can give Maquis Raiders and other small ships a much-needed offensive boost, especially if that ship’s attack dice are increased. There are also two copies of this Upgrade in this faction pack for all your low Primary Weapon Value swarms! 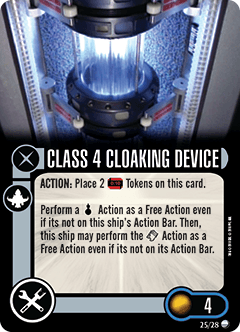 The Class 4 Cloaking Device rounds out the Upgrades for this faction pack as a 4 SP Tech Upgrade that’s one-per-ship unique and can only be equipped to a Maquis Raider. It gives the ship it’s equipped to an Action that places 2 Time Tokens on it to perform a Cloak Action as a Free Action and gives it the ability to perform the Sensor Echo Action the turn it Cloaks as a Free Action! This card not only further contributes to the high Agility Value of the ship (7 defense dice with Cloak! ), it also increases the already significant maneuverability of this ship by allowing it to Sensor Echo. In combination with Maquis Tactics, this ship can perform a normal maneuver, Cloak, Sensor Echo, attack, and then move again! 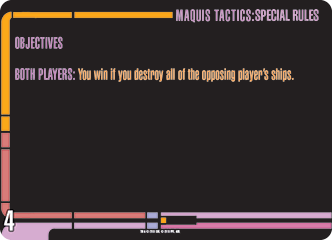 Finally, we give you the second Mission from the faction pack, the appropriately named Maquis Tactics. 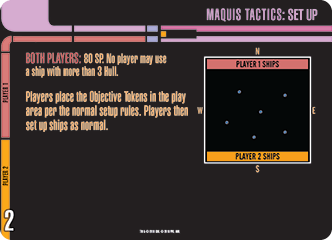 This Mission requires 2 players, the Maquis Tactics Elite Talent Upgrade, and 6 Objective Tokens. 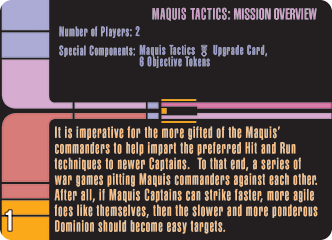 This mission is a series of Maquis wargames wherein the seasoned Maquis commanders will impart the hit-and-run tactics of the Maquis on the newer, less experienced captains. For the set up of this scenario, both players build an 80 SP fleet with no player using a ship with a Hull Value greater than 3. Players place the Objective Tokens in the play area per the normal rules for setting up Objective Tokens. Then, one player sets up within 4” of the North edge and the other within 4” of the South edge. The special rules for this Mission are Training Day and Learning to use Shadows as Cover. 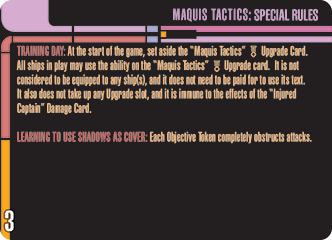 Training Day allows all ships in play to use the ability of the Maquis Tactics Elite Talent Upgrade card as if it was equipped to them. This means all ships get to move after attacking and can attempt to further outmaneuver the opposing fleet! The Learning to use Shadows as Cover special rule turns all of the Objective Tokens into miniature Planet Tokens that obstruct all attacks that go through them completely. The Objective of this Mission is simple: destroy all opposing ships. That’s all for today, folks! This new Independents Faction Pack introduces some fun and thematic updates for 4 of the more minor factions represented in Star Trek: Attack Wing! There is so much to be excited about with this faction pack we truly hope you enjoy playing with everything in it as much as we enjoyed creating it for you! Be sure to contact your local friendly game store to let them know that you want to order the new Star Trek: Attack Independents Faction Pack – A Motley Fleet. All this exciting content and more is included in each Faction Pack for the low MSRP of $29.99. Be sure reserve your faction pack today and keep an eye out for other new products coming soon! Visit WizKids at WizKids.com/AttackWing for additional information about Star Trek: Attack Wing and keep an eye out for more previews coming soon!